Paul and I rarely engage in orgies of consumer spending, but when we do... well, let's just say we're good at it. If all had gone according to plan in 2004, we'd have spent last February and March in the hell that is living in one's house in the midst of a remodeling. By the end of 2003, I had finished the drawings for our badly needed kitchen remodel, and we had paid a deposit to the cabinetmaker, chosen most of the materials, lined up a contractor. We had even arranged to have a demolition party, with a number of friends set to arrive with sledgehammers and crowbars to take the old kitchen apart. (There's nothing that's quite as much fun as tearing out crappy old stuff, and our 1970's kitchen is a fine example of such.) Instead, we spent last Spring in an entirely different sort of hell. Now that we've made our way out of the worst of medical hell (there's still some billing to be dealt with, but don't get me started...), remodeling seems like a piece of cake. We've reestablished contact with our cabinetmaker, and need to set up a new schedule for the project with our contractor. I've been thinking again about light fixtures, countertops and appliances. When Paul mentioned at the beginning of last month that our very nice neighborhood appliance store was holding its annual warehouse sale, I said sure, let's go see what they have. On Saturday morning, 4 weeks ago, we struggled out of bed at an unusually early hour, over the objections of our cats, and drove to the appliance warehouse. We arrived half an hour after the sale began. The parking lot was packed. As we walked toward the warehouse, we saw portable propane heaters, of the sort that restaurants around here use on their decks, along the side of the building. These, along with a few stray coffee cups and newspapers, provided evidence that there had been a line of people waiting to get into the sale. When we walked into the warehouse, I laughed. It was a madhouse. Rows and rows of stoves, dishwashers, refrigerators, wall ovens... and at least twice as many people as appliances (or so it seemed), all trying to make their way through the narrow aisles between the shiny objects of desire. We were looking for a range. What we had in mind was not a "commercial" range, but just a nice moderately-priced gas range with a stainless steel finish. It seemed that everyone who had been waiting in line before we arrived wanted the same thing. All of those ranges had SOLD tags on them. So, we continued to wander, thinking we might at least find a reasonably-priced range hood. 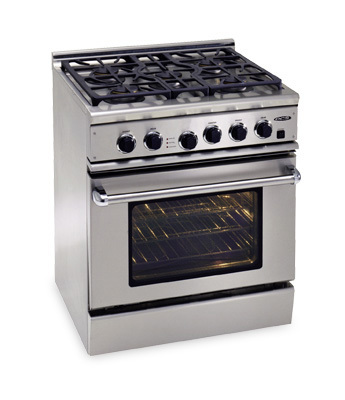 And we did, on the same aisle, where, for some unknown reason, no one had yet claimed this "commercial" style gas range, which was on sale for over 50% off, making it about the same price as the ranges we'd been considering. (Ooh, look how pretty and shiny!) We snatched the tag from the front of its box, revealing the SOLD tag below, happily made our way to the front of the warehouse... and then followed the line of people waiting to pay for their appliances out and around the back of the warehouse to its end. An hour later, and a nice chunk of frequent flyer miles on our credit card, we were on our way home, congratulating ourselves on our skillful shopping. A couple days ago, two very large, heavy boxes were delivered to our house. For the next, um, couple of months? quarter?, they'll be in our garage, waiting until the new kitchen is ready for them. Guess I should get to work on that schedule.